Got up at stupid o’clock (6.30 am for f’s sake) and hubby drove heroically through the rush hour to the City Hospital. Arrived after an hour’s driving, and it took us another 20 minutes to find the neurophysiology suite. We asked five different members of staff, none of whom really knew, but fortunately the sixth person did know and we finally arrived, more than a little fraught. We suggested that more signage might be needed . . .
Had the nerve conduction test. Not very pleasant. About on a par with the mammogram yesterday, but at least I didn’t faint. I am such a wooss. Home, four hours sleep, still absolutely knackered. Cat has new collar and tag – heaven only knows how she lost the last lot. The tag did turn up on a neighbour’s lawn, but the collar must have just disintegrated. She is very docile and tolerant though and didn’t seem to mind the new one being put on at all. She just let us. Bless. Monday night hubby’s ES came to stay with his youngest child, who is an absolute delight. He’s two and a half, and very sweet. He chatters away quite happily, and had a wonderful time kicking/throwing a ball round the garden with me yesterday. It’s great to see them. Tomorrow am cancelling my plan to go to the Birmingham Rag Market and am going to *rest*. Yesterday I did manage to get the daffs out of the bed I’m going to replant, but that was about it. The shopping arrived and was put away, all in order. This is the local garden centre I go to, despite living a five minute walk from an extremely large one. I won’t name the large one, but the plants cost three times what they should and I have had endless trouble with them. It’s so enormous I can’t walk round it without a rest. It also sells all sorts of other crap – house ornaments, stationery, anything it can. The one I go to, link below, sells garden stuff. It’s reasonably priced, good quality, and there is always, always somebody to ask for advice who knows what they’re talking about, and always somebody to help lift heavy stuff. Can’t beat it. Today, went round to YD’s sister-in-law-to-be. Lovely, lovely family. Little girl, 3, little boy, 1. Bless! Little boy is about to be christened, and a new dress has been bought. We decided that the flared net petticoat needed to be taken in, rather than the dress taken up, so I did that and it’s going to be collected tomorrow. Not difficult really, and easier than I thought. My appointment came today for my nerve conduction test, which should show if I have carpal tunnel syndrome or not. It’s at 9 am at the City Hospital (used to be Dudley Road), which is a bit of a bind, because it’s a long way, and means hubby driving in the rush hour. Hmph. That all means me getting up at stupid o’clock and that’s never good. Ah well. I ought to stop now really, and anyway I’ve run out of things to say. Ooh, except that I’m reading Lionel Shriver’s “So Much For That” and absolutely loving it. And I saw a Kindle today, and have decided not to be sneery about it, it looks really good! so it’s on my wish list. I wish! Right. Monday – dentist, checkup and scale and polish. Tuesday – pedicure. Wednesday – recovered. Today – hairdo. Have also booked my treatment at Indigo – hubby gave me a voucher for Xmas, but I wanted to see how the wonky hands, wrists and feet were going to be treated before I booked anything. Now I know – 5 steroid injections in the feet, hopefully no surgery, but possibly: nerve conduction tests on wrists, if they come up positive for carpal tunnel syndrome, surgery on each wrist, one at a time. Then, hopefully when they are healed, I’ll be able to knit again. Yay! I try to organise my weeks so that I have at least two days with nothing booked, otherwise I end up taking a month to get over a week, if you see what I mean. Have just finished Molly Gaskell’s “Frankly, My Dear”, which is an in-depth look at Gone With The Wind. Excellent, really enjoyed it. Now I want to watch the film and read the book. My copy disintegrated because I read it so much. So I’ve had to order a new copy, and a blu-ray DVD. The casual racism in both is appalling, but that’s how things were then. Dreadful. Unimaginable, really. Hairdo – am delighted with it. Excellent hairdresser. We always have an interesting talk too – today it revolved around surnames and how important they are. Mine of course was changed, probably from Gould or Gold, at some time in the mists of history, because my dad was Jewish, and traced his family back to the Spanish Inquisition (what people will do in the name of religion! ), when they emigrated to Poland. When they arrived in the UK there was (and still is) anti-Semitism around, so the name was Anglicised. But surnames generally tell you loads – Mason of course means that at some point the family were masons. Smith – lots of Smiths because there are blacksmiths, locksmiths, all sorts of smiths. Johnson – John’s son, Baker is obvious, the list goes on. Hair guy is interested because his surname belongs to a Catholic saint – (ooh, are there any other sort of saints? mm, must check that out) – I’m sure there will be loads on the internet about it. Had a lovely talk with my friend Deb on Saturday too. It’s so good to see friends. We’ve known each other 45 years. That’s a big number. Also spoke to my friend Sarah today who lives up north now. We learned Italian together at Adult Education and have remained friends since. Her children are younger than mine (well, she’s 11 years younger than me! 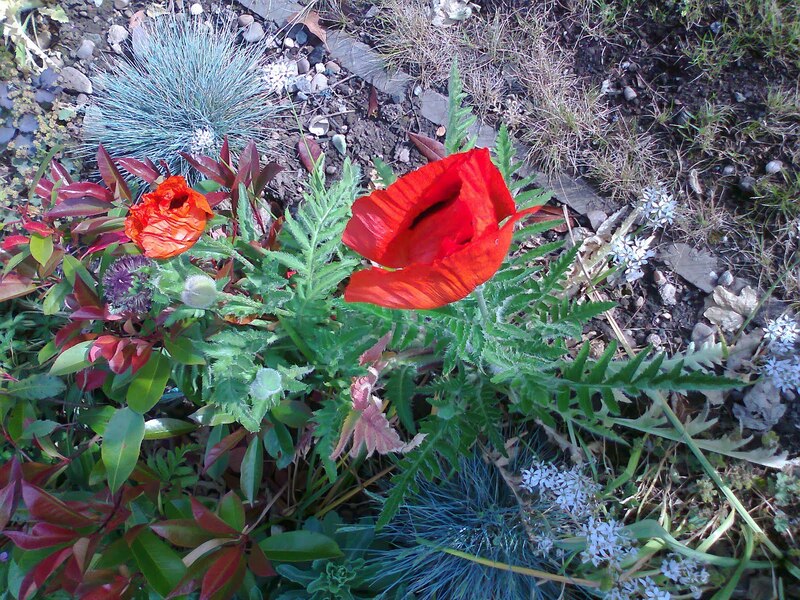 ), but her son is off to Uni this year – O. M. G.
Am planning to completely replant one of the beds in the garden. Plan: in the autumn, get up all the old plants, replant in a large pot all the ones I want to keep and overwinter, dump the rest, weedkiller the whole bed, cover with black plastic bin liners held down with bricks, and then in the spring plant up again, minus the rampant stuff which has taken it over. Very pretty, white flowers, don’t know what it’s called, but it needs to go. Tomorrow – shopping arriving from Waitrose, pottering about gently in the garden. Well, that’s my life so far this week. Ooh, spoke to my lovely niece (I have four lovely nieces) and she’s made a life-changing decision. Bless her, I’m sure things will improve for her now. I seem to have a lost a blog. Never mind, it wasn’t that interesting. Saw the Hand Guy on Wednesday. He thinks I have Carpal Tunnel Syndrome, but before he actually operates he wants me to have nerve conduction tests. Good thing too. Yesterday – what did I do? can’t remember now. Oh dear. Cognitive function not all it could be. Today – shopping delivered, then to Post Office to return tops to Marks and Spencers, and the Boden tops (which were in material much too fine for a substantial person like me, much more suitable for a teenage twiglet) as well. Also got my photo done for my new passport – was horrified to discover it had expired. I was equally horrified at the photo. God, do I really look like that? baggy eyes, old and gaunt? That’s not what I see when I look in the mirror. Well, it is now, of course. Then trekked to the building society to sort out online banking. What a performance. Walking up there seemed such a good idea, but wasn’t. I had to walk back again, of course, and that just about did me in. So slept lots this afternoon. Tomorrow – FA cup final! hooray! Manchester City v Stoke. 3 pm kick off. Excellent. Good excuse for a lie in, then leisurely lunch, shower and dress, and then after the match my friend Deb is popping in on her travels (Tewkesbury, Shirley, Redditch, all over the Midlands basically) so that’ll be lovely. Just finished Jessica Mitford’s “The Gentle Art of Muckraking” – brilliant. Loved that woman. Excellent. Now on to Frederick Forsyth’s “Cobra”. Thrilling, unputdownable. Hubby worked very hard on the lawn today – seeding, top soil, feeding, lots of digging and stuff. He loves his lawn. I spoke to Rejane today, and we both think that it’s a “man” thing. Her husband is the same (although where they live it’s so dry he hasn’t had to mow the lawn for weeks, because it’s just not growing). I don’t really care about the lawn and would be very happy with it all ripped up and nice pretty slabs down – so much less work – just some flower beds and a few pots. I suppose the green is nice, but god, the work that goes into it. Mowing, digging, aerating, sand, topsoil, lawn weed-and-feed, god I couldn’t be bothered. Rejane says things are slowly returning to something resembling normal. Some days are better than others, and some nights she sleeps, others she doesn’t. About half and half. She’s so resilient. Life is at least something like normal – she and Yves were off out to some friends for the evening. That’s good. But there you go. Each to his or her own. Me, I like the flowers and shrubs. Am considering perennial cornflowers and maybe a rhododendron – I fancy a white one. Will ruminate on this during the summer, and see how things are by the autumn. Right. Feeling a bit better today. Pain receding, although hip still not good. Saw the Hand Guy yesterday – I’m to go for nerve conduction tests, although he’s pretty sure it’s carpal tunnel syndrome. He doesn’t want to actually operate though until he’s sure. Fair enough, I say. It’s an operation done under local anaesthetic, thank heavens, and should fix it. If that’s what it is. Saw my friend Sylvia today and had sharp words with her recalcitrant computer. It was running like a snail, despite a pretty smart spec (I built it, so I’m boasting a bit here). So I did a disk clean up, a disk check, and left her to defragment it and hopefully that should help. Also removed several spurious toolbars from her internet browser, and that certainly sorted out that problem (it was loading very slowly). Then after my pm sleep, phoned the mortgage building society people to sort out re-registering for internet banking. What a performance that turned out to be. They apparently have my date of birth registered wrongly, so after getting out all the papers (12 years of them) for the mortgage and covering my desk with them, I have to go the branch anyway to sort it all out. But it did make me go through the papers and sort them out properly. I thought I’d sorted them out, but they were in a bit of a muddle. Can’t have been a good day – must check them again another day though in case I’ve muddled them up again. Then I thought – I know, I’ll take my passport to the building society to prove I’m me. And it went out of date on 27th April. Gaaaagh! So I need to renew that too, at great cost (£77.50) with another photograph. Oh dear. All this “no smiling, no anything” makes me look like a serial killer. 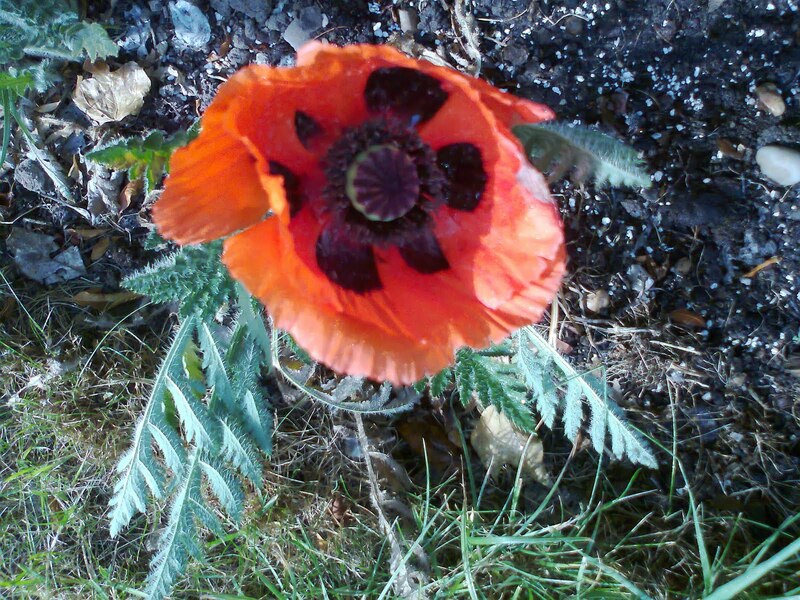 On the upside, I have dead-headed the poppies. All three of them. Hmm. But there are more flowers growing on the same plants. The Boden tops arrived and are going straight back. Material is much too thin – very pretty on somebody young and stick-like, but not so good on somebody a bit more curvaceous, shall we say. So, after we’ve put away the shopping tomorrow, it’s off to the post office, tarted up a bit so I don’t frighten the horses/children, and post off the M&S and Boden tops. Also hopefully get the passport photo done (hence the tarting up – which is really only blusher and mascara, and possibly a bit of lipstick). What a busy life. For some anyway. Not so good today. Slept late yesterday and today, dragged myself out of bed, had breakfast (bowl of Bran Flakes), then shower. The shower head fell onto my ankle bone and foot, which left me a bit shaken, and had to call Vic for help. That’s ok now, but my hip is absolutely dreadful. Had intended to go for a walk today but that’s out of the question. However the painkillers have helped a bit (and the ice packs) and I have at least put the bread maker on for some bread rolls. Trouble is when I am in pain I tend to feel a bit sorry for myself. Not an attractive trait I know, but if I’m left to myself, and able to have the odd cuddle from hubby, it does pass. Retail therapy helps, of course, so thank goodness for the internet, and Boden, Next, John Lewis, and all the rest. Have ordered two new tops from Boden, cotton jersey with linen, apparently a sort of slub, and am anxiously waiting to try them on and see how they look. 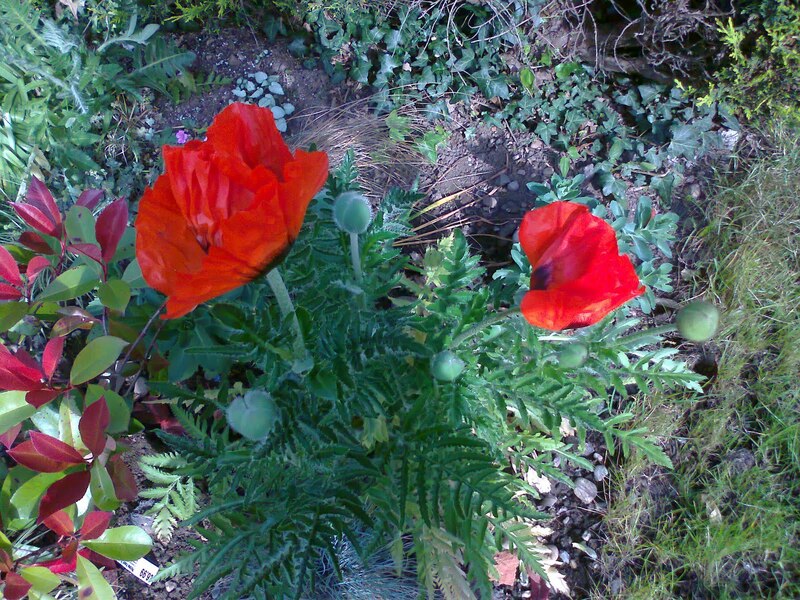 The poppies in the front garden are going bonkers. Hooray! the chives are doing their chivey little thing, and YD has promised me a cucumber plant! how exciting. Just need to wait till the end of this month before we can be sure there’ll be no more frosts, and I can plant up the tubs with the tender plants – I have five tender trailing fuschias, a red begonia and some trailing leafy things. Not sure what they’re called. I had intended to weedkiller the front drive today but what with the hip/back thing, and the threat of rain, will have to press “pause” on that for now. I think there’s a tree seedling under the hedge, though, may have a look later, after lunch. If you don’t yank them up when they’re still seedlings, in no time at all they’re trees and impossible to deal with. Must really make the effort and eat some lunch I guess, always feel a bit better after food. Now then. The orthotic insoles were very comfortable to wear, but caused the bursitis (all three of them) to be very painful last night. However, I am going to persevere, as instructed, because although some might think I’m a bit rebellious, at heart I’m a really obedient person. Not sure hubby would agree, but I do what the doctors tell me anyway. Today I have planted the delphinium, replanted a pot which looked a mess – now it has three different little grasses in it and looks much better – planted the new hebe, called Sweet Kim, in the pot with the pathetic looking hebe Heartbreaker, and planted the pathetic hebe in the back garden to give it a second chance. I also painted, in white gloss paint, the watering can which has been used for lawn weedkiller. It says Lawn Weed Killer – not very imaginative I know, but clear, don’t you think? – on both sides. The rose and the tube I have just painted a cross on (no room for words, or even letters). The paint and the can were in a terrible state, so are going to the tip next week with all the other stuff which is starting to be a nuisance now. Then a lovely shower. Two different parcels arrived today – one from Marks and Spencer – and surprisingly I need the size 14 of the fabulous Autograph shirt I’ve bought, whereas with the tunic from Wallis, the size 12 fits really well. Ho hum. Luckily I’d ordered both sizes 12 and 14 in both, so just need to take back the ones that don’t fit. Next week. Now of course I’m completely knackered and will have to sit down, ice pack on back to start with, gradually moving to hands and feet later, drinking tea and reading The Importance of Being Seven by Alexander McCall Smith. I love that man. He writes such lovely, lovely books. Ok, right, off to drink tea and read now.